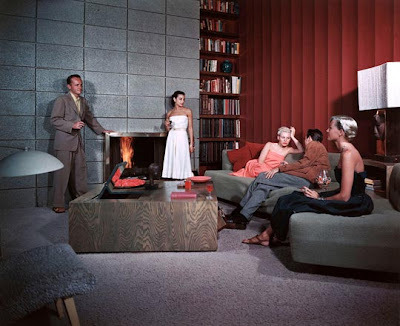 Mid Century Modern Atomic Indy: Julius Shulman Lives on. Immortalized. Julius Shulman Lives on. Immortalized. He captured our passion through his lens. 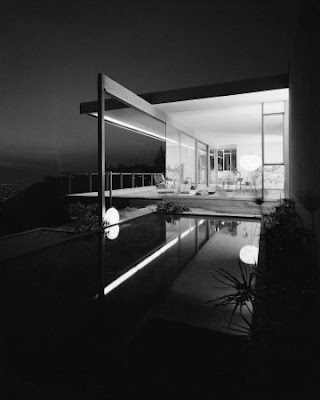 Famed Mid Century Modern photographer, Julius Shulman passed away 7/15/09 in L.A. He was 98. By all accounts he lived a full and boisterous life. He hung with the greats and made them greater. Several people who had met with him recently, relayed warming stories of him still passionately engaged in modernism, and eagerly discussing his work. 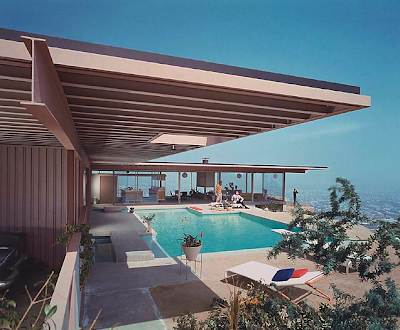 Julius Shulman showed us the essence of mid-20th century modernism. He defined it through his lens. He was the captivator and facilitator of our architectural fantasies. He brought us closer. Through him, the world knows what Case Study House #22 looks like. Feels like. He delivered California modern to the rest of us. 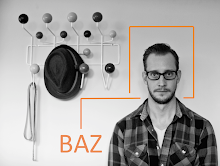 Borrowed a few images from the world-wide-inter-web for us to remember and discuss. This is but a small sampling of his masterpieces. Visual Acoustics is a recent documentary on Julius Shulman's life and work. Film is currently making film festival rounds. Click image to watch preview. • See L.A. Times for article on Shulman's passing. • Watch recent interview with Shulman from Dwell. • Check out NPR to hear an interview from 2005. • Procure books to drool over in remembrance. 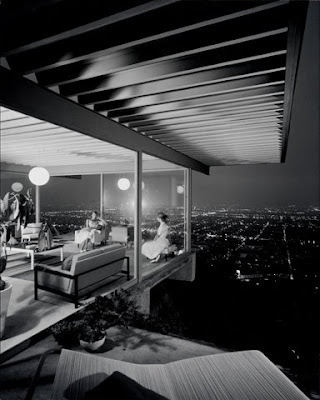 Amazon has a decent selection of Julius Shulman Books. Please share your thoughts on Shulman's work. How does it move you? Hola Dios te bendiga siempre y prospere la obra de sus manos. 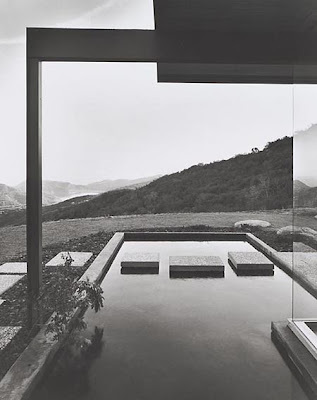 As an architect and photographer, I have always admired Shulman's work. I have seen him speak a few times and spoke to him briefly after a lecture in Houston. What a gem. He half-jokingly referred to himself in lectures as "The Great Julius Shulman," a moniker I'm sure he picked up by hearing himself referred to as such. But he was actually an enormously down-to-earth, hardworking artist who was one of the first to share the vision of the early modern California architects. 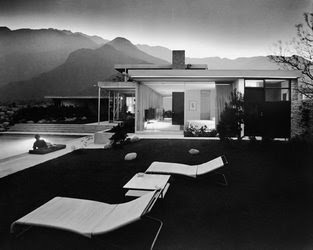 The Case Study House Program owes a great deal of success to Shulman's vision of modern living. What I remember most about his lectures and what inspires me most today is the complete dedication to getting the shots and getting the work done regardless of itchy business realities such as whether he would be paid or not. He did this casually, cheerfully, and jokingly, and he knew how important it was to represent California modernism so ideally in pictures. Philosophically, he knew that success would come if he just continued to do good work. And he was right. Shulman came to the site, he spent the time, he waited for the moment, he got the shots. The amazing shots. 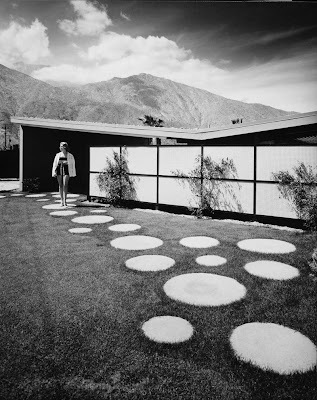 What is lost in our hindsight and reverence for the Case Study House Program is the fact that it was groundbreaking, difficult and financially stressed. Yet Shulman brought his best because he believed in the art. Not only that, but he continued working well into his eighties (maybe later?). Lugging view camera equipment around and staging shots is not for the meek, even with assistants. I don't feel that he will be missed the way I often do when people pass. For Shulman, I feel that his amazing legacy will continue to be revered after a long and fruitful life. What more could a person want? 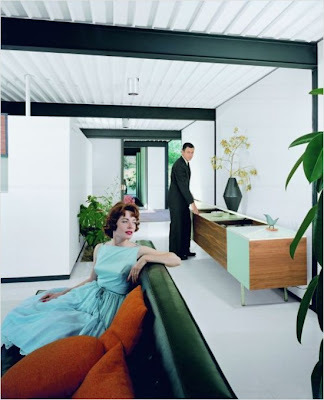 Well, I'm not that familiar with his work other than some of the Case Study House 22 pics. But those pics always depicted the ultimate in cool-ness as far as I was concerned and certainly fueled my passion for modern houses. A wonderful photographer obviously, and thanks for sharing some other pics that I wasn't familiar with. His photos take my breath away. I can't wait to see the documentary.